How to Take a Screenshot on a PC Without Any Program? Do you know that you are capable of taking screen shots without the need to download a certain screenshot software? 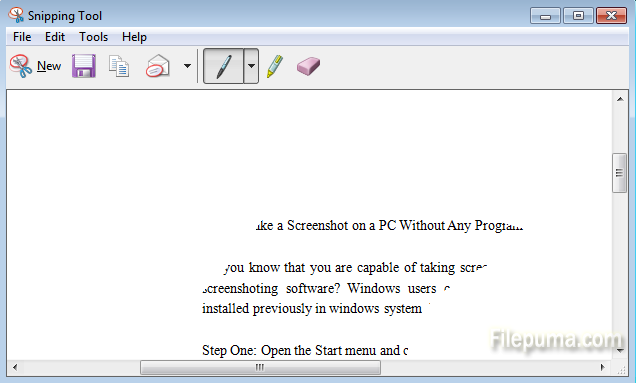 Windows users can take screen shots with the help of sniping tool installed previously in windows system. The process is quite easy. Step Two: Open the “Accessories” folder, find the Snipping Tool and run it. Step Three: Click the small drop-down arrow to the right of “New” to choose which type of screen shot you want to take. Follow the instructions given by the Snipping Tool to capture a screen shot. Step Four: Click “File”–”Save as” at the top-left corner of the window to save the image.